Holographic video displays, featuring three-dimensional images, are about to "go large" and become a lot more affordable at the same time, thanks to the work of a team of Brigham Young University (BYU) researchers and their collaborators at Massachusetts Institute of Technology (MIT). It's all about manipulating light. Three of the primary methods include: reflection, refraction and diffraction. In this case, diffraction is the key, and essentially enables lines—almost any type—to bend and filter light. In the journal Review of Scientific Instruments the team reports using surface acoustic waves as a dynamic pattern of lines to control light's angle and color composition. How does it work? The magic happens on the surface of a special crystal called lithium niobate (LiNbO3), which boasts excellent optical properties. Beneath the surface of the LiNbO3, microscopic channels, or "waveguides," are created to confine light passing through. A metal electrode is then deposited onto each waveguide, which can produce surface acoustic waves. The resulting frequency division of color enables a new type of color display. This means that "for a wavelength display, we don't need to rely on color filter wheels or dedicated red and blue pixels," explained Daniel E. Smalley, assistant professor of electrical engineering at BYU, who first reported an advance in this realm in Nature in 2013, while he was a graduate student working at MIT with his advisor V. Michael Bove. Instead of a color wheel, any color combination is possible with their approach simply by altering the frequency of the signal sent to the "white waveguide pixel." In other words, Smalley said, "we can color the output of our display by 'coloring' the frequencies of the drive signal." "As a bonus, this interaction also rotates the polarization of the signal light so that we can use a polarizer to eliminate any noise in the system," he added. 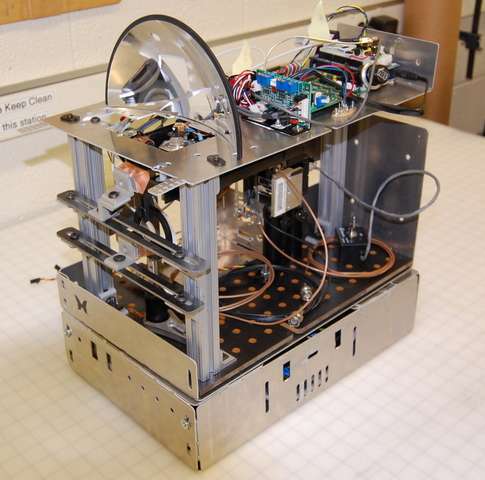 In terms of applications, the team's technology adapts and combines techniques from telecom and integrated optics in a way that makes it much less expensive than previous approaches. 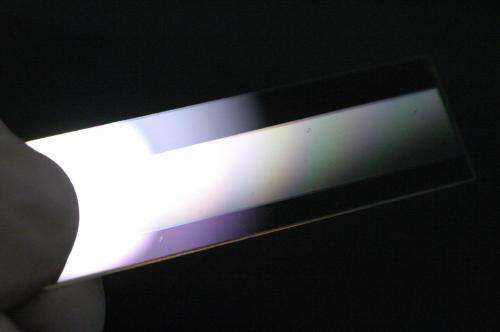 "We can use this technology to make simple and inexpensive color waveguide displays—including inexpensive holographic video displays," Smalley pointed out. "This can drop the cost of a holographic video display from tens of thousands of dollars to less than a thousand." Holograms are meant to be large. 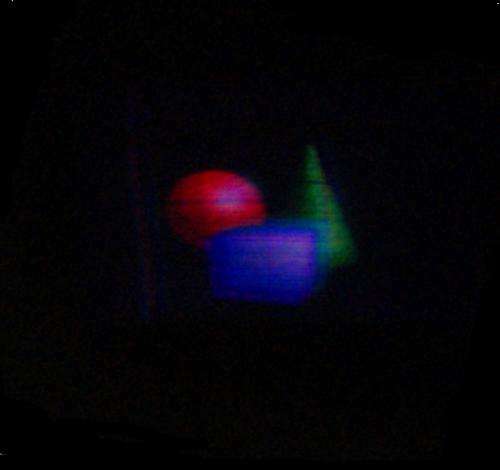 Now that there's a simple and inexpensive color display technology, Smalley and colleagues are working on ways to use it to create large holographic video displays—on the scale of room-sized displays. If they have succeeded in creating a low frequency acoustic 'hologram' to modulate the pattern for an optical hologram: This is indeed a breakthrough. The advantages of modulating 'slow' sound instead of 'fast' light where their common pattern has the same wavelength are immense. IIRC the problem with holographic displays is not so much the display itself, but rather the enormous computing power which is required to compute interference patterns in real time. I would be curious to see if there is any correlation between the color-producing frequencies here and the colors perceived by sufferers of synesthesia. I wonder if the colors 'generated' are similar. Looking at the image it seems they are using something like a Mirascope (with the imaging part where the object is usually placed). I have one of these toys at home. It's a pretty neat optical illusion device. Making this large will be tricky (but not impossible), For the simplest geometry the mirascope is quite a bit larger than the actual viewing area. I can see that the projection mirror is a concave. Presumably to convert the virtual (behind the hologram surface) image into a 'real' image in space (in front of the mirror). My query regards their method of acoustic wave modulating an optical imaging system. Especially if the order of magnitude differences between the speed of light and speed of sound. (3x10^8 and 3x10^2 m/s) maps to the difference between the optical image frequency (~10^15 Hz) and their acoustic waves frequency (~1GHz ??). If so the latter frequency is much more manageable as a digital signal processing exercise. Do something that solves a real problem, instead of just making another toy.